The Rockford Chapter NSDAR gives DAR Good Citizen awards to the recipients from all participating area high schools at a special program each February. 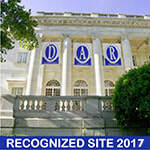 The goal of the DAR Good Citizens program is to encourage and reward the qualities of good citizenship. This year, 15 area high schools participated. Each school’s DAR Good Citizen receives a DAR Good Citizens pin, certificate, and wallet recognition card. They are also recognized at the end of the school year at their school's awards ceremony. A member of the Rockford Chapter NSDAR attends each ceremony to hand out the award. The top winner for participating high schools receives $500 and his or her name is inscribed on a plaque that is displayed at the school until the next year's winner is chosen. Michael Von Driska from Keith Country Day School. Michael Von Driska, Essay Contest Winner, with his parents Paul and Beth Von Driska.